If you work with 25 iPad wielding students in a classroom, then you already know that sharing large video files between iPads or between iPads and computers comes with some friction. Sure,there’s a festival of ways to transfer content from a student’s iPad to your computer or vice-versa, or from a student’s iPad to another student’s iPad. (AirDrop, Dropbox, Instashare, PhotoTransfer WiFi, Email, just to name a few) but each has it’s limitations – especially if your school’s Wi-Fi is flakey or the internet is slow. A Mobi My iStick in your pocket is a pretty neat solution. When you plug the iStick into your computer it behaves just as any USB thumb-drive would – because it is a USB thumb-drive. But slide the slider over, and at the other end is an Apple-approved lightning jack that fits into the lighting port on a student’s iPad. 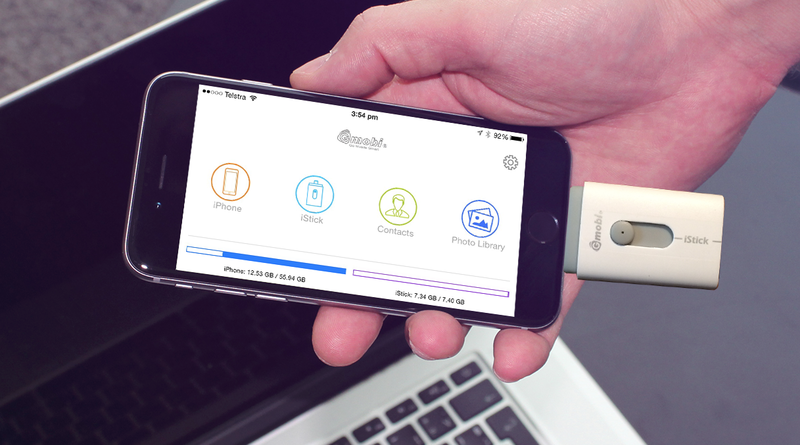 It’s the first USB thumb-drive that works with an iPad and it lets you copy files directly between iOS devices (whether or not they are your own) and computers, without needing Wi-Fi, bluetooth or an internet connection. Copying files to the device from a computer is as simple as can be. Transferring those files to an iOS device is just as straightforward. When you plug the iStick into your iOS device, a pop-up message asks to use the iStick. You click Agree. The iStick app opens, you select the “iStick” tab and you can see all the files on the iStick, open them, move them to the camera roll etc. You can even play movies on the iPad screen, directly from the iStick without first copying them to the iPad (Super if you are running out of storage space on your iPad!). On the iOS side, things are not quite as simple as they are on the computer. You need to install the (free) iStick app on every iOS device that you want to use the iStick with. Working with Photos and movies is straightforward enough. Within the iStick app you see a “Photo Library” folder. That shows you all the Photos and Videos on your iPad, which you can then easily copy to your iStick. For other documents, however, the process is clumsy and slow. You need to first open the document in the app that created it (say, Pages) then choose “Open in” and select iStick. Then you need to open the iStick app (on the iPad), select “iPad” (or “iPhone”), navigate to the inbox folder, select the file and chose to move it to the Documents folder (still within the “iPad” tab of the iStick app on the iPad). THEN (if you haven’t given up by now) you insert the iStick USB thumb drive, navigate to the Documents folder in the iStick app, and choose to move the file from there to the iStick. Once you have done that, it’s simple to drag it off onto your computer as you would with any USB thumb drive, but the process of moving documents to the iStick is horrendous! If you want to shift large videos or photos between devices quickly and avoid doing this over Wi-Fi – this is a great solution. It would allow your students to create movie projects on their individual iPads, and then you could pass the iStick around and they could all copy their finished product to it. If you want to increase the storage space on your iPad – because perhaps you have a model with only 16GB – again this is a great solution because you can store movies on the iStick and still play them from there without first having to copy them back to the iPad. If you were to move the videos off your iPad any other way (Eg. upload them to Dropbox) you would then have to re-download them before watching them! If you are travelling, and want a way to back up the photos and movies you are taking – or to transfer them from your iPhone to your iPad in the absence of Wi-Fi – it’s great! But if you were hoping to use the iStick to conveniently shuttle all kinds of miscellaneous files – PDFs, text documents etc – between iOS devices like you are accustomed to doing with USB thumb-drives and computers … forget it! Sure, you can move files that way. (It’s not that it doesn’t work, per sé) – but the process is so graceless that you’d be better off attaching your files to a self-addressed email! Access to learning, then and now. Learned or Learner: Do you learn more than your students do? Publishing a podcast just got simple!